Why Choose Designer Plants Hedges & Green Walls? Quick and easy to install – Do it yourself (DIY). Green all year-round – Why wait for the real thing? Resistant to rain and frost – Perfect for cold and wet climates. UV Treated – Suitable for your backyard and outdoor space. No watering required – Artificial Plants certainly don’t die. Instant results – no need to wait. Zero maintenance – Saving you time. Long lasting – saving you money. Improved Privacy – Letting you do what you want to. Allergy free and pet friendly – no more hay fever. Can go anywhere with an existing support, such as a fence or wall. Are Hedge Panels, Green Walls and Vertical Gardens all the same? Great question, all of ours are high quality uv resistant wall and fence coverings that look awesome! Hedge panels simply a more traditional leaf look, whereas the vertical gardens and green walls often have a wide range of foliage, including grasses, stems, flowers and a wide variation of foliage. They are all great for making your space look better! 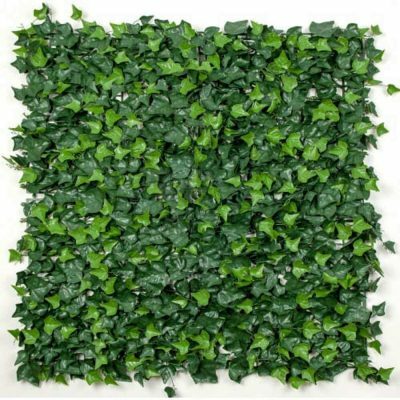 Hedge panels are artificial hedges specially designed to adorn and decorate walls, fences and other surfaces. They’re a stunning, lifelike way to beautify your fences, enhance your yard, and keep your privacy…well, private. It’s a quick, affordable, convenient alternative to messy and expensive landscaping. So natural-looking, you’ll think it’s the real thing! Are hedge panels easy to install? Yes…they’re extremely easy. Installs in minutes, requires no special tools—even if you’re not handy and have no prior experience. If you still need help though, we do offer installation around VIC (Melbourne), NSW (Sydney), and QLD (Brisbane) Australia. What size are the hedge panels and vertical gardens? Any of our vertical gardens or panels come as a 1m by 1m panel made up of various smaller sized tiles. They have already been joined together into a 1m by 1m panel (except our select range metal backed green walls which are 90cm x 90cm too). Can I get a custom sized panel? All the panels can be cut to size using a pair of scissors – if you have an area 2m by 50cm for example, a 1m by 1m panel can be cut in half and joined together to create that size. Can I mix different panels together? Definitely! All you need to do is cable tie the backing together. You can mix 2 of 10 different styles, simply join them together. How do I attach hedge panels to my fence? Hedge panels can be attached to any surface in a number of ways. 1. To a wooden fence or plaster wall with the assistance of a staple gun, by stapling the frame of the panel to the fence. 2. To a cyclone fence, like the kind around tennis courts or swimming pools—with plastic ties or easy twist wire. 3. To a metal fence, or other hard surfaced wall – using self tapping screws. Can I use hedge panels outdoors? Absolutely. All our panels are specially designed and treated for outdoor use – they are UV treated so will last longer outdoors. Please refer to our UV warranty page for further information. You can also see our UV resistant reports here for more. 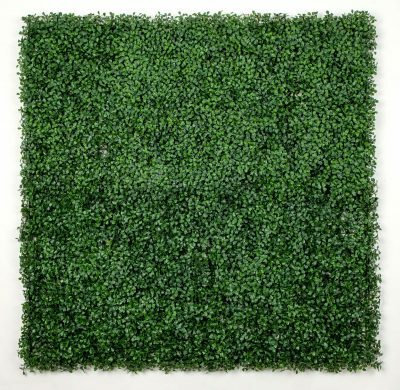 Our UV green walls and hedge panels are made with the best UV inhibitors available for such plastics; to ensure long-life whilst ensuring they still look life-like. Where can I put hedge panels? Virtually anywhere. Use them to enhance chain-link and other fences, walls, balconies and patios. As well as covering unattractive places such as bin storage areas, utility sheds and old walls; or simply make any ordinary surface as lush and beautiful as a garden in springtime. Please note that every job is unique, and the suitability of the artificial plants will vary from job to job, and be site specific, so please seek appropriate 3rd party advice as required to ensure compliance with building codes and safety requirements. What size area do hedge panels cover? All sizes—no matter how big or small. 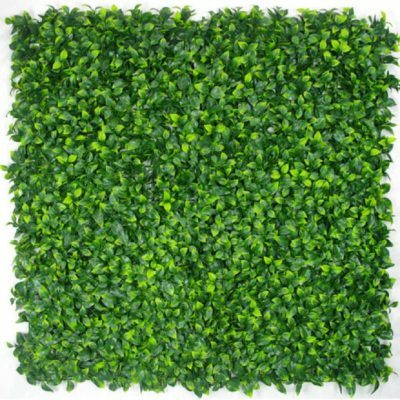 Each artificial plant panel is 1 square meter (smaller panels have already been connected for your convenience), and can be easily trimmed down or connected to other panels. You’ll have no trouble customizing it to fit your exact specifications. What are the measurements for artificial plants? All measurements provided are from the base of the pot (ground – to top leaf). My Artificial Plant has arrived, but all the leaves are straight out, not bushy – how do I fix this? All plants are sent in tightly packed boxes to avoid them rolling around in transit, and becoming damaged. This results in the leaves and branches being compacted around the trunk and pointing upwards. Remove the plastic packing bag / box. Start from the bottom and fan the leaves outward (be gentle). Lightly move the leaves to the desire shape and over the coming days they will settle. Victoria – 2 clear business days. SA, NSW, ACT – 2 clear business days. QLD, TAS – 4 clear business days. Perth, NT – 5 clear business days. The delivery of the artificial hedges to remote towns (more than 50km out of the CBD may take an extra 2-3 days). If you need your order delivered urgently please call us on 1800 617 341 to discuss the options and costs. Yes. Installation available upon request. Contact us to find out more. How often should I use the UV protection spray on non-uv plants? We would recommend that if placing your non-uv plants outside, you regularly spray the plant with two coats of our UV spray. As a general guide we would recommend the following frequency (noting we cannot guarantee the longevity of the plants if they are indoor plants being used outdoors). Full sun / hot parts of Australia (WA, NT, QLD) – every 4 months. Partial sun / cooler parts of Australia – every 6 months. Limited exposure (through windows, or less than 1 hour a day) – every 9 months. How long will it take to get my Hedge Panels or Fake Plants? Normally, just a few days. And depending on your shipping preference, you can even have it sooner. Due to the high demand for our Hedge Panels we may have run out of a particular style, however, we will notify you on the product page if this infrequent event does happen. Can I get a custom design and style or different plants? Absolutely. Simply email us a picture of the design you’d like, and we’ll create your own personal hedge style, or alternatively we can show you some custom ordered designs that have previously been made. If you are after a fake plant that we don’t have online let us know, as more than likely we will be able to source it. 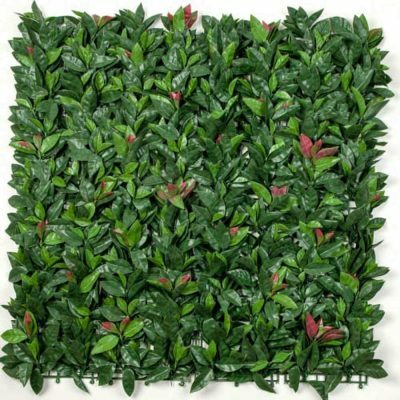 I live interstate / overseas, can I still purchase these hedge panels? Certainly. We’ve even shipped large orders to customers in outback NT, FIJI, NZ and Africa. Contact us today to discuss shipping options. How long has Designer Plants been in operation? Designer Plants has operated from Sandringham for over 8 years. We began as a Live Plant Nursery and expanded to the indoor and pot plant industry. 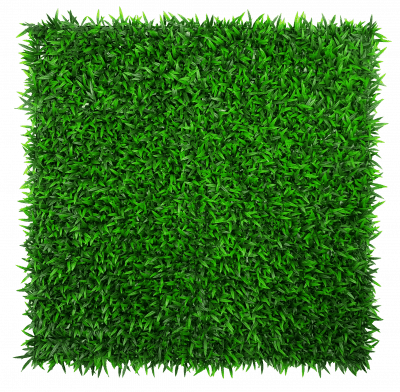 Over time, we recognised the major advantages of man-made hedges and grass, and since then we’ve focused on delivering high quality and affordable artificial hedges. In 2014, we moved to a new showroom in Carrum Downs, Victoria. Which substances are restricted under ROHS? We care about our people, and our environment so don’t use any of the following toxic chemicals. We don’t sell fake plants made of cheap and nasty plastics, that’s why they are ROHS compliant. Our returns policy allows reruns where the product is faulty. Refunds are not offered when someone simply changes their mind or doesn’t like what they got (we take our own photos of all items – not photo-shopped mock ups). If Designer Plants make an error and deliver the wrong item we will cover the return freight back to us, and the freight to deliver the correct item. These terms and conditions do not limit your rights under Australian Consumer Law. For information regarding the green wall UV warranty, please refer to our warranty page here. We use an online merchant (CBA) who is located in Australia to process card payments, alternatively, you may choose to use PayPal which allows you to use your PayPal balance, bank account of card of your choice. What is the $100 Naked Wine Voucher Deal? If you enter the code at checkout you will receive a $100 Naked Wines Voucher towards an order from their online store, subject to minimum spend requirements deemed by Naked Wines. You must be 18 plus to redeem. How do your offers work? Free Samples – Just get in touch with us and pay the shipping and handling costs and we can send you a sample. Cash Back – When you refer a friend you’ll get $50 if they spend more than $1,000. Your beautiful hedges await you!